The next morning and following days felt as if they had passed simultaneously in slow motion and at double speed. I spent every waking moment checking headlines, social media posts, and Puerto Rican newspapers for any available information. I listened faithfully to multiple channels on Zello for updates on nearby municipalities and religiously checked the geotag for my town on social media for evidence that someone might have service in the area. As photos and videos of the catastrophe began surfacing, I was devastated. Biblical floods carved out mountains as forceful winds stripped the trees bare, and mudslides buried cement houses. El Yunque, the only rain forest in the United States and the place dearest to my heart, looked as if winter had forced all the trees and vegetation into an eternal hibernation. For the first time, the island fell asleep in complete darkness to a deafening silence no longer filled by the lullaby of coquis. The following months proved to be worse than anyone had imagined. 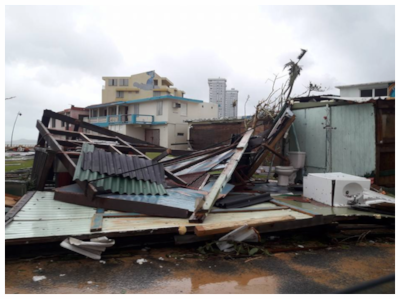 3.4 million Puerto Ricans were forced to live in damaged homes or shelters without electricity, water, transportation, adequate sources of food, or proper medical care. The Federal Government’s response was nonexistent as many people from the mainland preferred to debate the citizenship of Puerto Ricans and their fault in the unavoidable destruction rather than donate money or vital resources to those in need. Over 200,000 Puerto Ricans fled the island looking to rebuild their lives in the mainland. According to a study performed by the BBC, it is estimated that 4,600 Puerto Ricans died from the hurricane and the government’s lack of response to the humanitarian crisis. Nearly a year later, the US has finally officially released the number of deaths caused by Hurricane Maria, a number that’s estimated at just 2,975. It is clear that 120 years after its acquisition, the United States still views the people of Puerto Ricans not as humans, but as disposable colonial subjects. As we approach the anniversary of Hurricane Maria’s destruction in Puerto Rico (and the U.S. Virgin Islands), thorough information about the continuing struggles on the island remains absent from news headlines. Regardless (or perhaps because of) the lack of coverage, many theatres have elected to bring one musical back into the spotlight: West Side Story. Written in 1957 by Arthur Laurents with music & lyrics by Bernstein & Sondheim respectively, this enormously popular update of Romeo & Juliet details the romance between Tony, who is Italian, and Maria, who is Puerto Rican, and sets the love story against the backdrop of a gang war on New York City’s Upper West Side. West Side Story paints a shallow picture of Puerto Ricans living in New York City, depicting characters who either yearn for their homeland or reject it altogether, with no meaningful gray area or character development. Consistently performed by theatre departments in public schools throughout the country, West Side Story might be the commonly whitewashed production in musical theatre history. I’ve seen The Sharks (the Puerto Rican gang) performed by more white people than not. Admittedly, I was one of those students. Sophomore year of high school, the theatre department decided the spring musical was going to be West Side Story. For reference, it is estimated that 96.8% of the town I live in is white, with 8% of the entire population identifying as Hispanic or Latinx. Although my family is from PR and I am of Puerto Rican descent, I have very pale skin, naturally blonde hair, and blue eyes due to my European ancestry. Still, I believe there were only two people in the entire production who actually belonged to the Latinx community. I was one of them. It was no shock that all the people of color in the cast and those who looked remotely ethnically ambiguous were cast as Sharks. When I reflect back on my time rehearsing for West Side Story, I feel conflicted. The production was a foundational experience for me: I quickly discovered I wanted to pursue theater in college and as a career choice. The show also introduced me to lifelong mentors who taught me important lessons regarding how theatre can be a vehicle for change. However, those experiences are overshadowed by incredibly painful memories, such as when I was told by an ensemble member that I, the only Puerto Rican in the entire show, should have been cast as a Jet because I didn’t “look Spanish.” I was deeply offended; the remark seemed to erase my entire identity in an instant. Today, it is evident that I would not be cast as a Shark, regardless of my background. Because I walk through the world as a white woman, I could never accurately portray the characters of the story and their experiences. The second memory is of myself and other young women cast as Sharks lathering ourselves with self-tanner. I burn with rage when I think of the time spent I’ve spent in dressing rooms spraying myself with Sally Hansen Airbrush Legs before going onstage. For years, I kept this practice a secret, wondering if I had subconsciously internalized racism passed down to me or if I was desperate to feel I belonged to my community. Maybe it was both. I have always been so proud of my identity, my community, and my heritage, and yet I participated in an egregious act. I often think of what my grandfather would have said, had he been alive to see the show. Would his heart have sunk at seeing his granddaughter stomp on her heritage? Would he ask how I could possibly participate in a dismaying theatrical convention that had historically contributed to the oppression of people like him, people who sacrificed everything in such an unwelcoming world? I was supposedly portraying the story of Puerto Ricans grappling with racism on the streets of New York City in the 1950s—something my own family experienced—except I had the benefit of washing it away when I got home. It is important to mention that neither the director nor any educational/administrative figures involved in the show suggested that the actors take these steps to appear more authentically “Hispanic”. I’m not sure they even noticed. Yet the impulse didn’t arise out of the blue. My own lack of research, the lack of perspectives in my community, the educational system, and the way our society views people of color all contributed to the reality that many of us in that production performed in brownface without blinking an eye or even realizing it. Although the conversation surrounding race & ethnicity in the United States has shifted greatly within the last seven years, what we did was never ok. It is deeply concerning that I did not learn about or have knowledge of blackface and its history in the United States until my freshman year of college. When our systems of education selectively erase uncomfortable but intrinsic aspects of history, younger generations are susceptible to re-enacting antiquated, dangerous practices that re-inscribe dehumanizing stereotypes. As the words ‘Puerto Rico’ have become more common in article headlines, so has the idea that West Side Story needs to be revived for modern day audiences. It was recently announced that a production directed by Ivo van Hove and choreographed by Anne Teresa De Keersmaeker will return to Broadway in 2020. A remake of the 1957 film is slated for the near future, scripted by Tony Kushner and directed by Steven Spielberg. Recently, I came across the casting breakdown for West Side Story’s upcoming Broadway production. To my surprise, the need for people from the Latinx community was not mentioned at all. While this is concerning, I am even more troubled by the following question: Why do those in Hollywood and the theatre Industry insist on continuously revisiting this work instead of collaborating with Puerto Ricans to share their real life experiences and voices in new works? That means doing more than bank-rolling remakes directed by famous artists who have barely any insight on what it means to belong to such a community. With the current rhetoric surrounding Puerto Ricans and our island, the catastrophic wake of Hurricane Maria is also an opportunity to create a dialogue about Puerto Rico’s fraught relationship with the United States. People such as Lin Manuel Miranda and Quiara Alegría Hudes who have captured the essence of what it means to belong to such a vibrant community. They have given a voice to multiple different perspectives in imaginative ways. Still, there are artists with stories to tell that don’t involve West Side Story: stories that accurately convey the vast amount of experiences from a very special group of people. Puerto Rico, like many other places in the Caribbean, and Central & South America, is a true melting pot of different cultures and peoples. Before Christopher Columbus’ ‘discovery,’ Puerto Rico was inhabited solely by its indigenous people, Los Taínos. Although there are still direct descendants of Los Tainos in Puerto Rico today, much of the indigenous population was destroyed in less than twenty years after colonization, along with villages, resources, land, aspects of the culture, and the language. Not too long after, Spain brought Puerto Rico into the realm of the Atlantic Slave Trade, which was ripping human beings from the continent of Africa from their land, their homes, their families, their cultures, and their languages as well. Nearly 100 years later, many people of Chinese descent emigrated to to Puerto Ric. The Puerto Rican gene pool is therefore the epitome of diversity, with traces of European, African, Indigenous, Middle Eastern, and Eastern Asian blood. Our DNA paints a portrait of a history too often neglected. Our culture is as nuanced as our people, who have continued to transform relentless hardship into opportunity for growth. Our people, like many others who have been victims of colonialism, have managed to make everything out of nothing. Looking back on my time in West Side Story, I am hurt by both my ignorance and this country, one that continuously fails in educating our citizens regarding the most horrendous parts of our history. While I am ashamed, embarrassed, and deeply sorry that I performed in brownface to imitate an Euro-centric perspective of what it means to be Puerto Rican, I am extremely thankful that now, nearly seven years later, I have the knowledge and wisdom to know that my community is a rich and colorful one. I am evidence of that, along with every Afro-Latina too often erased from this narrative and picture because they don’t fit the physical stereotype. Still, my position is vastly different due to the privilege I hold as a white-presenting Latina in 2018. In all honesty, I don’t know that productions of West Side Story like the one I was in will ever stop being produced in the United States. But, it is everyone’s responsibility to educate himself and ensure that West Side Story is not the only story being told. Victoria Preis is a multi-disciplinary artist based in New York City. She last wrote for OSB about unpaid internships in the Business. She also writes for Samuel French’s Breaking Character Magazine and is a recent graduate of NYU Tisch.